To set up Price Based on Country, you have to set up zones, then add countries and currency options to those zones. You can create as many zones as you like to build your country-based pricing strategy. A Pricing Zone is a group of countries to which you sell your products at a different price. If you need, you can set a different currency and an exchange rate. Customers will buy at the price corresponding to the zone of their country. Use the option Price Based On to choose between using the billing country or the shipping country for the matching. To set up shipping zones, go to WooCommerce → Settings → Zone Pricing →Zones. The first time you visit WooCommerce → Settings → Zone Pricing →Zones, there is the “Countries not covered by your other zones”. The default WooCommerce pricing and currency are used for customers whose country does not match any of the custom zones you add. Go to WooCommerce → Settings → Zone Pricing →Zones and click the Add Zone button at the top. Enter a descriptive name to identify the zone. Select the countries to include in the zone. You can include as many countries as you need to build the pricing zones. Each country can be only in one zone. Choose the currency the zone will be priced in. This option determines how you input the exchange rate for the zone. 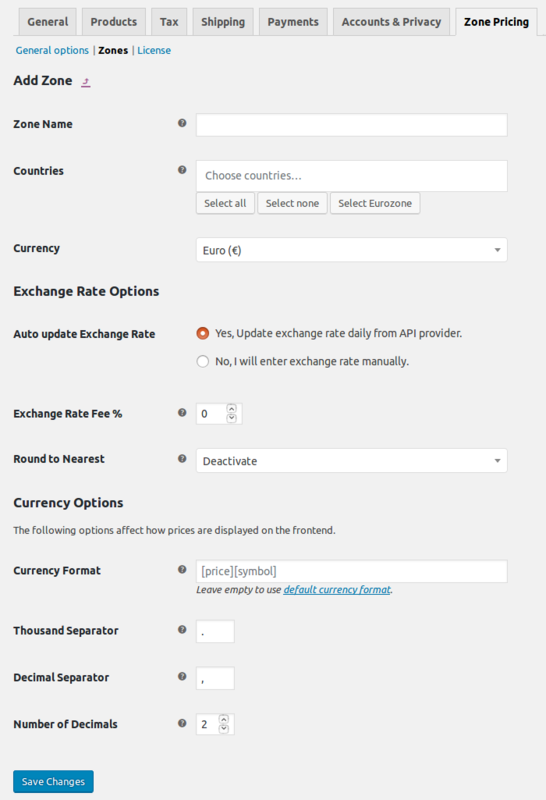 “Yes, Update exchange rate daily from API provider” means that exchange rate will be updated automatically from API which you chose in Exchange rate API option. “No, I will enter exchange rate manually”. Select it if you want to set your own exchange rate. This option is enabled when you select Update exchange rate daily from API provider. If you select I will enter exchange rate manually, the exchange rate used to convert an amount from your shop base currency to the zone currency. Currency settings change the look of how currency is shown to users from the countries of the zone. The following options only affect the front-end of your store. Currency Format – Set the currency format for the zone. Leave it empty if you want to use the General Currency Format. Select Delete to delete the Pricing Zone.